When starting the project Vanessa’s first task was to improve the function and flow of the kitchen. A large plant was that was taking up too much valuable storage space was immediately relocated and replaced with floor to ceiling cabinetry. “Having all of your food in one location rather than multiple cabinets is one of the goals when designing kitchens,” explained Vanessa. Another goal of the kitchen design was to provide as much storage space as possible. On a single wall in the newly renovated kitchen, there are nine drawers. “I love the cup pulls from Top Knobs and how the finish recedes into the cabinetry,” Vanessa explains. 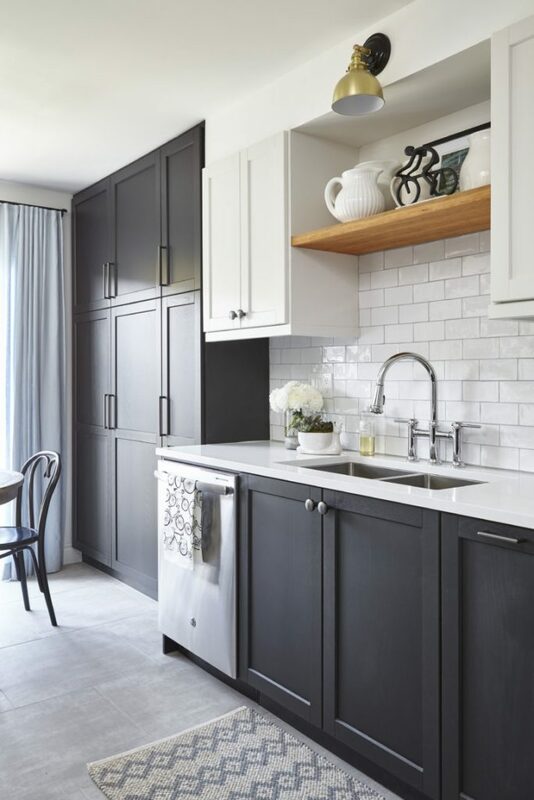 For a streamlined, yet trendy look, Vanessa utilized the Top Knobs Kinney Knob, Channing Cup Pull, and Kinney Pull in 7 9/16 inch, 5 1/16 inch and 3 3/4 inch on the drawers and cabinets. 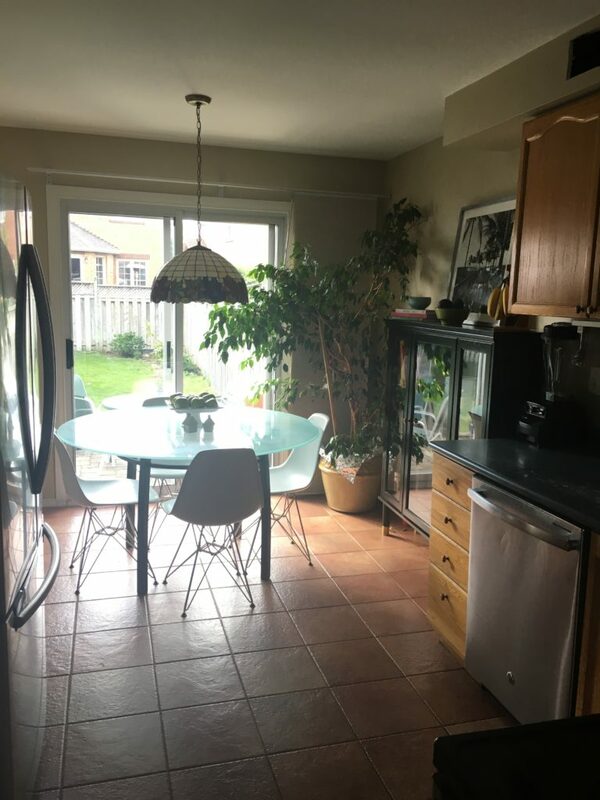 In an effort to achieve a more contemporary look, Vanessa replaced the old terra cotta tiles with more neutral large format tiles. 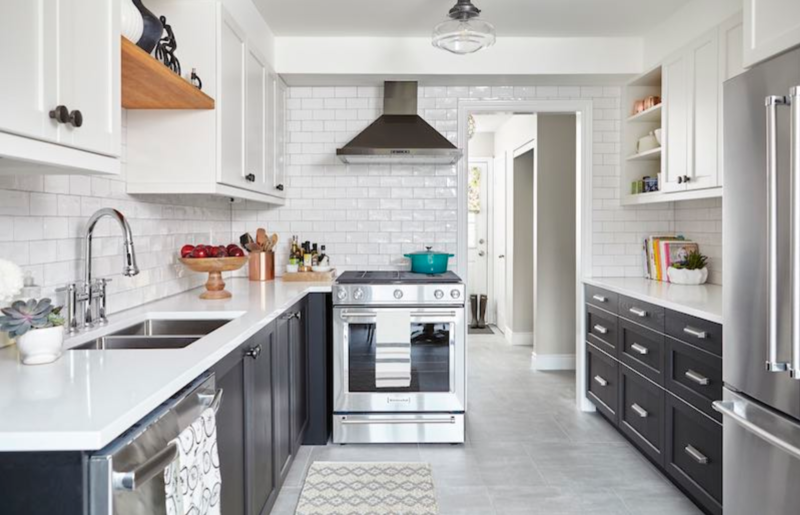 Budget-friendly cabinetry from IKEA and simple white subway tile also helped to brighten the room for a more inviting ambiance. 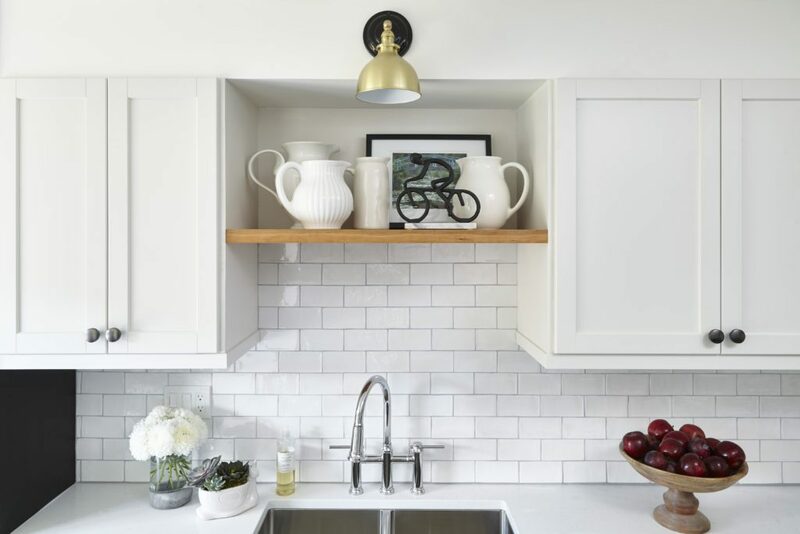 To create even more counter space and storage Vanessa moved the sink replaced it with a more on-trend offering that complemented the cabinet hardware. “I just love the modern take on a traditional bridge faucet,” she says. Last, Vanessa wanted to add a personal touch to the space. “My sister and her husband have owned a bike store, Bicycles Plus, in Whitby for around 30 years and as a result they are both avid cyclists.” To make this kitchen truly feel like home, there are a few references to their love of cycling in the kitchen: The vintage Tour de France poster that her nephew bought in Paris on our trip this summer, the tea towel that she picked up in Vancouver, and a black cycling statue from HomeSense. 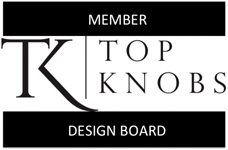 A special thank you to Vanessa for choosing Top Knobs to transform her sister’s kitchen! See Vanessa’s entire One Room Challenge project here!